I had a rodent problem. Eek! But in my defense, it’s sort of inescapable here. I live near downtown, and right next to a creek. It’s that perfect buffer zone between the rural and the urban that’s an ideal breeding ground for city-friendly wild life. We have a raccoon family that lives above Jeremy’s garage (same family that steals cat food off my friend’s porch, around the corner), opossums in the yard (Harley got ahold of one once and it played opossum, faked it’s death, and sent me to bed in tears thinking my sweet pooch had killed it) and the skunks are . . . well, somewhere. We can smell them! Then of course, there’s the rodents. Rats and mice just love this neighborhood. Easy picking ’round here, between the residential foraging and whatever winds up creekside. The good life! And I always knew they were out there, but over time – and especially once I had the compost system set up – they really started making their presence known. In the back yard. In the trees. Multiplying. And then . . . under my house. So what’s a vegan girl to do? If the little critters are finding a way into your home – either under your floor or in your walls, you’ll need to seal off all entry points. Fill every crack, hole, and possible point of access into your house: around the exterior, on the roof, at the crawlspace/attic, and in the foundation. You can have this done professionally, or you can invest some time and do it yourself. Fill small holes with steel wool, which the rodents won’t chew through. Larger openings can be mended with hardware cloth and filler. Repair any damage to vents, and fit them with a screen. You don’t want to do anything that might draw their attention. Namely, food or hiding spots. So make sure your garbage cans and compost bins are on lockdown. Put away any pet food or birdseed that might be available. And finally, trim back or remove any foliage that sits alongside or hangs out over the house. 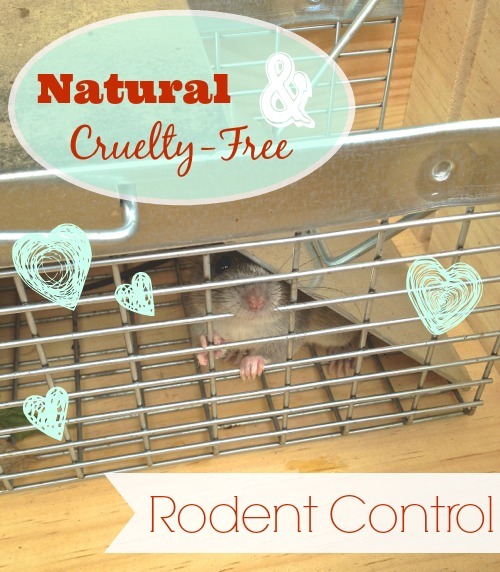 There are a few different natural products reputed to repel rodents. For a homemade solution, try sachets of Balsam Fir, a spray made from peppermint oil or wintergreen oil diluted in water, a spray made from equal parts ammonia and vinegar, or a solution made from 1 gallon water + 1/2 cup dish detergent + 1 tablespoon tabasco sauce. You can also plant peppermint and sage around the yard, which will help to ward off the rodents. However, if homemade seems like too much hassle, you can go with a more surefire, store-bought solution. I had good luck with Fresh Cab, which the company was nice enough to send to me to sample. 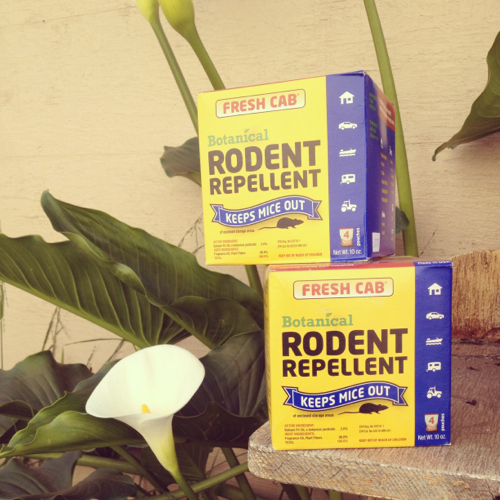 This is an all-natural product based on botanic rodent repellants, and it worked wonderfully for me for as long as it was potent. In other words, the rodents returned once the smell had worn off, I’d say 6-8 weeks. I was using this product outside and I imagine it would be more effective when used in close, closed quarters (which is how it’s intended to be used). Somewhere between a repellant and a removal system, these unique instruments emit a very high-frequency sound wave which is imperceptible to humans or non-pest animals, like pets. The sound is supposedly unbearable to rodents, and is reported to keep them away as long as the device is operating. There are a number of no-kill rodent traps on the market, and this is the solution that has worked so well for us. SO well! These traps are awesome and easy to use and of course, cruelty-free! We used this product in both the “chipmunk, rat, and weasel” size (for the rats) as well as the “mouse” size (for the baby rats and mice). All we did was trap them, drive them to a local park or hiking trail, and let them go. Easy peasy! These days the yard is pleasantly rodent-free once more. Occassionally, because of the close proximity to downtown and the creek, we’ll hear a wee wanderer out in the garden at night. But all we have to do is set the trap, catch the bugger, and chauffeur him away to his new home, and we’re good to go. That happens pretty rarely, these days. It is completely possible to rid yourself of rodents without having to harm them. I totally believe that now, and I think my experience is just proof of that. And I hope that if you’re ever facing an infestation of your own, you’ll consider the cruelty-free route. Edited to add: There’s a ton of awesome info and experience being shared in the comments below – please read through those for even more great tips and ideas. And as always, please keep sharing! Hey Sayward! Big fan of your writing! Been going through your archives :) I’m apprehensive about the ultrasonic device, as one has been marketed in South Africa to repel not only rodents but also cockroaches and such. We kept it on for months to no effect! Also, it might be a good idea to check the reach of these things, in case your neighbor keeps adorable rabbits or guinea pigs? - Make sure you drop the animals off at least 2 miles away from your house. Most mice can fairly easily make it back to your house within 1 mile, another mile is a good buffer. - The little box traps are known as Sherman traps and they’re the best and cheapest for small mammals. Tomahawk traps are the best for larger mammals. - If you need to relocate a slightly larger mammal (i.e. possum, raccoon, feral cat), don’t hesitate to call your local SPCA to have them trap and/or relocate it – they’re professionals with the proper equipment and know how to treat these gentle creatures properly so nobody involved gets hurt. This is great – thanks! I’ve always thought that if I had a blog I’d do a series called “vegan dilemmas” with issues just like this. I’d love to see on one spiders, if you know anything about effective ways to get rid of them without pesticide sprays. I now live in place with Black Widows and we know they live around our house – we’ve seen them and their webs. I have a tiny person, so I live in constant fear of her being bitten, but I don’t know what to do. So for now we just live with them and worry. Thanks for sharing all of these different options! We get a lot of visitors on our farm, and the number one thing that brings them right up to the house (I’m talking raccoons and opossums) is CAT FOOD. We had a timed feeder for our cats on the front porch, and both critters would figure out a way to get into the porch (the cats’ part of the porch is enclosed with chicken wire) to get to the food. The raccoons would actually unscrew the top, and then sit there and leisurely scoop the food out a small handful at a time. The opossums would tip it over, scare themselves, climb the chicken wire up to the ceiling and then not be able to get down without assistance. So all of this to say, I guess, that if you leave dry pet food out you will have visitors. Every spring/summer when our family cottage is opened back up, we find visitors from the past winter. I don’t know what was done before I started visiting the cottage, but the past few years Haveahart box traps have been used by whomever gets to the cottage first for the summer season. I agree that they are a safe and easy solution. We did the catch-and-release thing, and also sealed every damn hole that a chopstick could penetrate–took months. (Peppermint oil and the ultrasonic devices did nothing at all.) And I’m really happy we did. But I read later that this isn’t actually all that humane–certainly better than killing them, I still contend, but not completely cruelty-free. Mice live in colonies and can’t survive for long on their own. When you catch a single mouse and release him far from his home/territory and relatives/community, he is easy pickings for prey, and regardless won’t survive long. One solution is to get a fish tank and put each mouse you catch in there, feeding them until all the mice are caught, and then release them altogether. When I mentioned this to my husband, he said that he has limits, and this was beyond them. And I’m sure there are risks–to your health, for one. Has anyone else heard about this, and what are your thoughts? For now, I’ll continue to campaign for catch-and-release over any poison or kill trap, absolutely, but with reservations about the former being the ideal solution. I’d love to know what you think. I thought the same as Ann – that translocating animals is inhumane (and if it’s a rabies vector species, sometimes illegal depending on the geographics). We definitely don’t recommend it with cats because they are so attached to their homes (food/shelter/hierarchy) when we do TNR and any cat who is relocated needs to be contained to learn that their food/shelter source has changed. (And they are only relocated if their current area is being destroyed and we can confirm there is food/shelter/a caretaker in the new area helping with the process.) I had assumed it was the same for other animals as well, especially during bad weather. Re sealing – it’s also always important to know that you’re not sealing anything into a small space. It’s kind of obvious – but humane animal control usually stresses it especially during breeding seasons so I thought I’d mention it. Also, there aren’t that many wildlife/pest control agencies who start with the animals’ best interests – usually they’re pest control agencies who are just using non-lethal methods. HSUS does have a hotline for humane pest control and I think they also have references to the very limited agencies who have animal welfare at the forefront. Not every SPCA or ACO does the same thing or has a progressive wildlife field department – sometimes they’re mandated to handle animals as part of a contract re animal control so your mileage may vary there (in response to the comment below re SPCAs knowing the best info). Absolutely, great point about the neighboring pets. I’d say check the range of the device and if it’s anything close to being able to reach a neighbor (especially if you’re in an apartment building), then ask around and make sure no one keeps rats, mice, rabbits, etc as pets. As for the efficacy of the ultrasonic devices, I’m sorry they didn’t work for your bug problem! I personally haven’t tried them for rodent removal, but they do come highly rated and recommended. I’d love to hear from a reader who has tried to use them! Oh man, great advice here! Thanks Jo. And yes, I am *totally* guilty of the “Oh what a cute little guy, I can share my space with him!” mindset back in my early 20s. Learned my lesson the hard way, oi. Oh man Sarah, great question! A really tough one. Black Widows are a different story, and I’ve found a few in my yard at this house as well, so I understand your concern. I have relocated them to a wooded area (okay well if I’m being honest, Jeremy did that) and I’ve had a number of talks with Waits about poisonous spiders, what they look like, and how it can be hard to tell so it’s best to just avoid contact with spiders all together. That said, and only speaking for me personally, something that can physically harm me – especially as seriously as a Black Widow – falls under my rule of “self defense”. I swat mosquitos and I drown fleas and I think I’m within my rights to do that, because they are causing me harm. Similarly, I can imagine situations where I would feel I had to kill a Black Widow, and if I did that I don’t think it would tarnish my “vegan status”, or my sense of personal ethics/integrity. But I understand that this is a issue filled with grey area that will differ for everyone. I’d love to hear other people’s thoughts! Raccoons are soooo smart! I love them (even though the ones around here can carry parasites). I was at my friends house, on the front porch drinking wine (like ya do) and the whole little raccoon family came up for a cat food snack. She was like, talking to them and bargaining “Okay guys, fine, but just a little tonight!” They are so friggin cutie! It’s definitely not a perfect solution, but (I think) it’s the best one available. As for rodent communities, my understanding is that sociality is highly variable among species and subspecies, so relocating rodents may – or may not – break up some sort of social structure. It certainly does put the animal at greater risk of predation or starvation by being moved to a foreign location, that much is for sure. Still, I just don’t see a better solution. 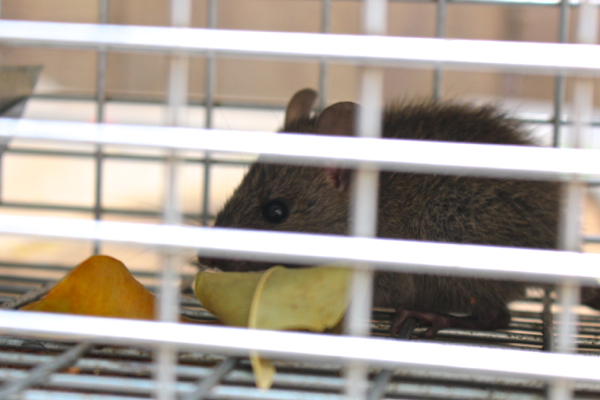 For what it’s worth, PETA and The Humane Society both recommend live trapping and moving rats and mice individually. I definitely wouldn’t call relocation “inhumane”, especially considering the only viable alternative. I shared my thoughts on this above, but I agree it’s probably very hard on the animals that get moved, and potentially could end with them being killed. However, I truly don’t see another, kinder option. I also take comfort in knowing that large animal welfare organizations such as PETA and HSUS recommend this course of action. It’s not only the animals being moved – it’s the animals that live in the place where they’re moved to. Rats are invasive (and non-native in most places), and compete for food and shelter of natives. Not saying that it’s a better option. Just a consideration. Just to clarify – by here I mean Australia, and the impact of Rabbits on native species is significantly terrible. They are one of the biggest contributors to loss of species. Obviously that’s at the fault of the British invaders for bringing them here to hunt, and not the rabbits themselves. Actually, the rabbit one is quite the conundrum – I’d like to hear (read) everyone’s thoughts. not going to naturalise, and there aren’t any natural predators. I’m against introduction of disease – it’s cruel. And poisoning (like 1080, which is “mostly” banned) is bad for the environment and wipes out our marsupials. Poisons were generally used as a control when it was impacting agribusiness, not wildlife. Obviously as Australia is an island, relocation isn’t entirely viable. And live export is pretty horrible, and where would they go? Great post! When I had a mice problem in my apartment, I did similar things. Cleaned up any potential source of mice attracting smells and sealed up points of entry. For areas that I could not seal, like the crack under my main door, I sprayed peppermint oil mixed with water which stopped mice from crossing as they did not like to cross that nose-numbing threshold. After living in the mountains for many years I’ve seen my fair share of mice! I’ve discovered one practically free way to live trap them. First get an empty cardboard paper towel roll and put a bit of peanut butter on one end. Find a shelf or low table in your house near where you see the mice evidence and put the empty roll on it with the PB side hanging almost halfway off the edge. Place a 5 gallon bucket under the PB side. When the mouse goes into the empty roll to get the PB the whole roll with him/her in it will fall into the bucket. Take them away the next morning! Yeah, it’s tough, but when our little people are at risk….well, if a human attacker went for my kid, I know that i wouldn’t hesitate to do harm. Maybe the most humane option in general (maybe- I’m just thinking off the top of my head here) for spiders like this would be to try to reduce the opportunities for them to breed in our yards. Like removing the debris from places they like to live, and squashing their egg sacks when we see them. That won’t be a complete solution, but might reduce the number of times we have to ask a spider for forgiveness before we squash it? Would love for you to write a post like this on the subject of ants! I read this post the night before we finally caught the mouse that had taken up residence in our home. I’m so glad we ordered the Have a Heart trap for it. I don’t think he entered through a hole in the house, but probably one of the times we had the door open to the backyard for the dogs to run in and out. My husband dropped it 10 miles away in the middle of a pine forest. Any other vegan arachnophobes here? In the Pacific Northwest (Bellingham, WA), we have really big spiders in the summer: the Giant House Spider. Like 3+ inches in diameter, and no, that is not an exaggeration. I mostly did catch-and-release, but after 8 or 9 trips to the park/ forest it got to where I questioned my commitment and sanity. And later research revealed that they were called House spiders for a reason and would not survive outdoor relocation anyway. Sayward, did you have these in Portland? How did you deal? I know they are not harmful to people, but rational thought cannot trump phobic fear. They just totally freak me out. Suggestions? Great article! Many pest control companies (even the “humane” ones) use kill methods. I believe in no kill. Animals are our neighbors; we need to learn to live with them. 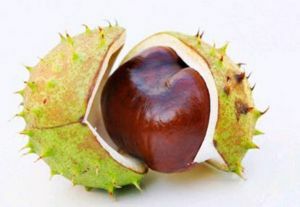 I am from England and over here a good prevention of spiders is placing conkers around the house, generally around windows and obvious entrances (air brick etc). As the conker grows old and decays it gives off a scent we cannot smell, but spiders hate it. I don’t know how good it could be against the big guns of the spider world, but it works over here. huh. Not sure we have those round these here parts. The best option is to feed them contraceptive – SenesTech has one in development. They are focusing on rats and mice first. A rats and mice, it’s in a fairly liquid form. Later, they will have contraception available for other species, including rabbits. All you do is feed it to them for a few weeks and then they are permanently sterile, both the males and the females.